Due to the modular design, the instruments can be configured with a selection of optimized ion guns, sample preparation facilities and a variety of special accessories in order to address even the most challenging analytical tasks. The computer control of all instrument functions and parameters ensures ease-of-use and a high level of automation. The TOF.SIMS 300 R has an industrial design dedicated to the demands of the semiconductor industry. Its recipes include trace metal detection with detection limits down to 108 atoms/cm2, detection of organic surface contaminants, high performance depth profiling, dosimetry of implants, and characterization of sub-micrometer structures and defects. The TOF.SIMS 300 R provides clean room compatible, automated 300 mm wafer handling, analysis and data reduction with high stability and performance. With the 300 mm high-precision four-axes sample stage a new level of sample navigation has been reached. A linear travel speed of 20 mm/s and full wafer repeatability of less than 1 allow fast and accurate sample positioning on the full 300 mm wafer. The advanced design of the transfer system guarantees clean and fast 200 mm and 300 mm wafer handling. 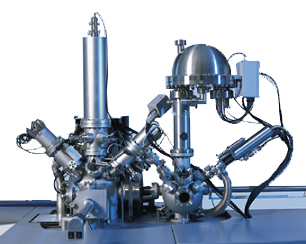 The layout with mini-environment, robot chamber with wafer storage and pre-aligner, and TOF-SIMS metrology module provides an optimum configuration for high sample throughput and excellent vacuum conditions.